The Battle of Cascina occurred between Florence and it’s rival, Pisa, on July 28, 1364. In the autumn of 1504, The Republic of Florence commissioned Michelangelo to create a fresco memorializing the victorious battle. Michelangelo’s fresco was to be hung in the new Florentine State Hall, the Palazzo Vecchio, opposite a fresco by Leonardo da Vinci depicting the Battle of Anghiari. Unfortunately neither Michelangelo nor da Vinci completed their battle scenes and the grand project was never realized. Some say da Vinci experienced technical difficulties, others that he was called away; Michelangelo was distracted from the work when he received an urgent summons from Pope Julius II. Michelangelo working from 1504-1506, had created a full-scale preparatory drawing, or cartoon, of the Battle of Cascina however, within a few short years of its creation it was destroyed being regarded as some contemporaries as the greatest of all of Michelangelo’s works. Now only a few drawings and sketches of the works survive. During the battle in 1364, the Florentine army, camped at the river Arno, attempted to relieve themselves of the heat of the day by bathing and swimming in the river. When the warning alarm sounded alerting the men to the approaching Pisa army, the soldiers, in all manner of undress, rush to grab their clothes and their weapons. This is the chaotic moment which Michelangelo chose as the central scene of his fresco. 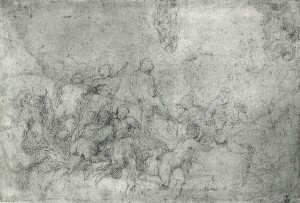 Michelangelo’s preparatory sketches of the battle and the men were admired by his contemporaries. The complexities of the bodies movements as well as the anatomical correctness and the variety of unique poses and positions were thrilling. 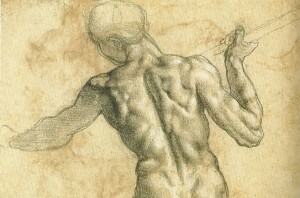 Michelangelo loved the human body so it is no surprise that he used the opportunity to create such a visual impact. Though never completed, the studies of the battle scenes by Michelangelo and da Vinci were copied numerous times and had a tremendous influence on generations of artists to follow.